Tapu Lele GX (Guardians Rising, 137/145) completes our countdown of the top ten cards of 2017. Everyone knows what this card can do – it instantly dethroned Shaymin EX (Roaring Skies, 77/108) as the most valuable card in the format. It costs $50 a card, and that’s for the cheap version. But oh what it can do – it’s funny that an ability to get just a single card can be so powerful, so game changing, so meta defining. So there’s not much I can tell you about this card that you don’t already know, but there is one thing that I’ve recently discovered that has blown the doors off the way I play Pokemon. There is a card that the meta has completely missed – I checked and NO top eight deck has run this card since it became standard legal out of the Burning Shadows expansion set. This card will revolutionize the way you design your deck and plan your strategy. It will give you an edge that no one else has because no one else is running it. You will use it in conjunction with Tapu Lele GX in ways that will shock your opponents and deal them a psychological blow that will give you a significant advantage. There’s no way, you say. There’s no way that such a card exists. There’s no way the greatest players in the world missed such a card. For those of you who didn’t just click the X at the top right hand corner of the screen, take a second to objectively think about it. When was the last time you teched this card into a deck? Uh huh yeah I can hear the crickets and mice in the background (well, mice, it’s way too cold for crickets). I just played 35 games with Golisopod GX Garbodor (if you want to see the break down or decklists go check it out on PokedeckCentral.com). I went 27 W 8 L with the deck. Let me tell you Super Scoop Up was the MVP of the decklist. Get past the fact that it’s a coin flip – treat it as a bonus. Treat it as an extra perk. For example, there were a number of times when I had Lele in hand turn one and a SSU as well. I played the Lele and went and got Sycamore. Then I played SSU and if I got lucky I went and got Brigette. If I didn’t, no big deal, I just continue on. I’m not playing Brigette without having some sort of draw support in hand anyways, that’s just not good strategy IMO. But when it worked, it gave me the turn one Brigette I wanted as well as the Sycamore I needed for next turn. You think Lele’s good when you can get one Supporter card? Imagine if you can go get two. SSU isn’t just for damaged Pokemon. I used it for Lele as much as I used it on injured Golisopods. I also used it on Pokemon who were Guzma’d up and stranded in the active position, and I even used it on Garbodor to pull him up into my hand so I could play Lele down again to get the Supporter I wanted. And then I would frequently put Garb back down on a Trubbish on my bench and reattach the Float Stone. That had to really tick off my opponent. Again, a psychological edge that your opponent can’t even possibly expect or apply to you. So while Super Scoop Up may have hijacked Lele’s review here, I just want to point out that SSU is an AWESOME complement to Tapu Lele. As usual, if you don’t believe me, go try it out for yourself. I guarantee that if you pull off the Lele Sycamore SSU <heads> Brigette maneuver, you’ll be completely sold on it. It’s almost like it’s cheating it’s so good. Tapu Lele GX is a great card. It’s ability is amazing, it can function as a decent situational attacker, and it’s pink. And purple. And if you pair it with Super Scoop Up, I wouldn’t be surprised if your win percentage increases. At last, we finally get to the best card of 2017: Tapu Lele-GX! It was #1 best card of Guardians Rising as well. Why is this Pokémon card so special? That’s because the card reintroduces certain effects that made previous cards a staple. In fact, Tapu Lele GX has a phenomenal package that can fit in one card, and that’s a sign of a very good card. Tapu Lele GX is a psychic type with 170 HP, no weakness/resistance, and a retreat of one. It’s ability, Wonder Tag, works when you put this card from your hand to your bench. If you do, then you get to search your deck for a supporter card and put it on your hand. This boosts consistency, getting you what you need. It could be Sycamore or N to refresh your hand, Brigette to summon more basics, Guzma or Lysandre to select your target in order to finish it off. Energy Drive costs CC and does 20 damage times the amount of energy attached to both active Pokemon. This attack’s damage isn’t affected by weakness, probably as a balancing agent to keep another Mewtwo-EX war from happening. And finally, Tapu Cure GX costs P and heals all damage from two of your Benched Pokemon. So we have ourselves a Pokémon that can be in any deck due to Energy Drive being colorless friendly and guarantees you a Supporter card when you need it right away. However, the real question would be if you actually need Tapu Lele GX in your decks. I currently have only one copy of Tapu Lele GX and I don’t think I’d be able to get ahold further copies of this card because this card happens to be a chase card as well. Which means accessibility is extremely limited outside of buying singles and hoping to pull one from a booster pack. I also feel a bit irritated when I see a statement saying that decks need to have Lele in their deck to win matches. Lele DOES NOT win you every game; it just improves the consistency of your deck that could lead you victory. There are some decks that don’t use Lele and still won without such hassle. Then we get to some shortcomings. If you are forced to start with Lele on the Active, you just lost one opportunity of Wonder Tag. You could get away with this unfortunate start if you have more than one Lele or using Ninja Boy to swap Lele with another Basic from your deck. Once Lele has done it’s job, it just sits there waiting for it to be OHKOed and your opponent takes two prizes. There are some Pokemon that can actually hit for the full 170 even without exploiting weakness. Solgaleo (both GX and non GX), Garbodor, Drampa-GX, Volcanion-EX, Greninja BREAK, and more. Ability denial is still prevalent, and it could happen before you put this Pokémon on the bench. Those shortcomings made me conclude that Tapu Lele GX can be a useful card and a liability at the same time. That’s how I feel about in Standard and Expanded. It’s a great card, but not mandatory to put it (tournament results may say otherwise). In Limited, if you pulled this, you’ll use it. Notes: Tapu Lele GX offers a stellar ability…for a price. Players must analyze the benefits and drawbacks of this card. Although I’ve been generous with this card, I feel that this is probably one of the lowest scores I would give for a #1 card. I have a hard time believing that this card is regarded as “having no weaknesses” when, clearly, the card text says otherwise. Maybe if the ability, in addition, did something to compensate for being forced to start the game with Lele in the Active slot (something along the lines of “if you were forced to start with this Pokémon before the game begins, during your first turn, you may search your deck for a Supporter card and put it onto your hand) and/or having Energy Drive exploit weakness, then maybe, this Pokémon would be a must run with four copies no less. As it stands, this card has been carefully balanced to the point where there’s a huge gap of categorization in which we would label “overpowered” or “pathetic”. The effects aren’t revolutionary as players called out to be. If I wasn’t too concerned about these shortcomings, then I would’ve give this a near-perfect score for both Standard and Expanded. I did hear about Lele pairing with Super Scoop Up so that you can reuse Wonder Tag, but even then, you could risk flipping tails for no effect. When there’s a card that sees universal play, you know that this card is going to be very good, to the point where you have certain cards that took first place on BOTH the Pojo’s top X cards of the set and Top X cards of the year. Mewtwo-EX NXD, Muscle Band XY, Shaymin-EX ROS, and today’s card, Tapu Lele-GX! This card is very good because it blends most of the aspects from previous cards into a single card. You’ve got Wonder Tag which is identical to Jirachi-EX’s Stellar Guidance such that it fetches you a Supporter card. You also got Energy Drive which is a reworking version of X-Ball from Mewtwo-EX, except that it doesn’t factor weakness or resistance. Lugia-EX would be another good example as it’s Colorless typing means it cannot exploit any weakness in the Expanded card pool. It’s 170 HP is as bulky as Mewtwo-EX and Lugia-EX as well, but it has no weakness! And it’s retreat cost is cheaper than both of them! Tapu Cure GX is just…there, for when you want to fully heal two of your heavily damaged Pokémon so that they can continue to do its thing. I can imagine how excited players were when several cards were revealed in Febuary 2017 from PokeBeach. For the most part, the hype had delivered. You’ll see Tapu Lele-GX almost everywhere you play; however many copies that they ran varied, ranging from one to whopping four copies in one deck. I’m pretty sure 21times mentioned something, but you have a 82% chance of pulling a turn 1 Supporter card if you had 4 of the specific Supporter, 4 Lele, and 4 Ultra Ball. Ideally, it would’ve been Brigette to fetch 3 more Basic Pokémon or Sycamore to draw more cards. In the case of Standard, it’d be Cynthia or other potent Supporters who are more effective on your first turn. And if Tapu Lele-GX were to be your opening Pokémon when you begin a match, you can grab Super Scoop Up or another bounce equivalent to get it out from play. This is why Tapu Lele-GX remains to be a great card. Fortunately for this winter, you can find a promo box of both Lele and Fini for easy accessibility. Notes: The reason I took another look is that Tapu Lele-GX may be leaving rotation in 2019 because there are no further printings of that card. Even the print from Island Guardians Box this winter is an alternate print, keeping its legal status. One might wonder what standard decks might use in place of Tapu Lele? Probably not at this moment. If there is anything that is more important than extra damage, setup disruption, massive damage and mid to late game interactions is the ability to set up in the early game in a very reliable manner and get them going consistently. And good thing such a meta card exists, a true powerhouse of the highest end of the meta pole. The force in question is the guardian of Akala, Tapu Lele, which has decided to convert its ability to send Psychic Surges to increase its power of telepathy, which it can use to contact almost every person inside its small world (deck) and then pulling him/her out via a special Wonder Tag as its new special ability. Usually it’s a scientific girl which can transport Pokemon from an outdated system to a newer system to get 3 Pokemon to the field, a hero of truth and ideals who slows and disrupts opponents by giving both players a new set of cards based on your Prize counts, a Mega Evolution-focused professor which can give you 7 new cards but you need to throw your old cards away, a ghost trial captain which returns wounded souls and the destruction dude in card form, to name a few. The power of wonder tagging has been long heard, used and abused in many situations, both casually and in tournament levels, and it has been heard that players not using this ability are left behind. The ability is so revered that prices in singles is so much more expensive as demand for wonder tagging outstrips the number of Tapu Leles which can do so. Prices ranged from $50 for the normal Ultra Rare art, $70 for the Secret Rare pink background art and $99.99 for the rainbow rare art, the best looking of the lot and probably the most expensive grindable card. It’s not all show and tag either; it also has the ability to attack. Measuring the energy level of both the opposing Pokemon and itself, for a minimum of 2 colorless energies Tapu Lele deals 20x the number of energy attached to both Active Pokemon, i.e. Lele and itself with Energy Drive. Not as good as Gardevoir’s Infinite Force, but as a Basic Pokemon that can attack for a DCE, it is good enough that it can function as a tertiary attacker in all decks to break down walls, destroy 60 HP evolving basics or finish off weakened opponents. Sadly, like Zoroark, its GX attack is mediocre; for 1 Psychic energy you fully heal 2 benched Pokemon with its Tapu Cure GX move. But don’t let that last part fool you for it being a bad card. Nor do let the 170 HP and the 1 retreat cost fool you too. But do let that powerful ability, decent attack and the no Weakness and no Resistance property craft your head to establish Tapu Lele-GX as the must inclusion in all competitive decks and also the single best card of 2017. No buts and no don’ts for me. #1 Tapu Lele-GX – naturally topping out the must-have Supporter, Tapu Lele-GX is the must-have Supporter retriever and similarly to Guzma has a definitive advantage over a predecessor that fulfilled the same role in Jirachi-EX. 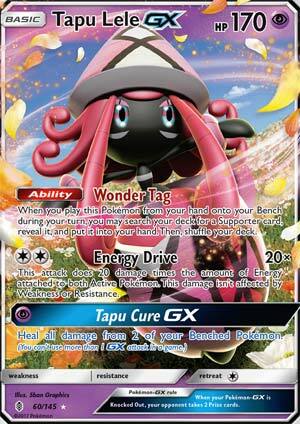 Tapu Lele-GX can retrieve a Supporter from the deck, and she can even dish out a powerful X Ball-like attack, albeit without applying Weakness/Resistance. Tapu Cure GX is also good recovery, but you’ll likely not need it most of the time because you’re either running a GX Attack that you want to use for your deck or because you’re dominating the match easily enough without needing it. Either way, Tapu Lele-GX tops it all off at #1 for 2017!